Check out Worship in the Capital District for a partial listing of the local churches, temples, mosques and meditation centers. If you don’t find what you are looking for contact the Spiritual Life Office at 454-5250. The first Mass of the 2018/19 school year will be held in the Hubbard Interfaith Sanctuary August 26 at 6:30 pm. After that, the Sunday mass will be held at St. Vincent de Paul Church. 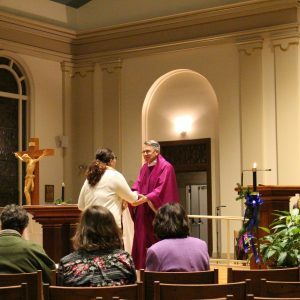 The College works with St. Vincent de Paul parish to provide opportunities for prayer and worship for those of Catholic faith on campus, at local campuses and in our neighborhood. St. Vincent de Paul Church is located at 900 Madison Ave.
Saturday vigil: 5pm and Sunday morning: 8:30am and 11am.